Summary: The secret key to the FM website’s great forecasting record is that we do only the blindingly obvious, and give no dates. Such as the long forecast of stability for the world economy, to be followed by ugliness. We revisit this again, showing that almost nothing is happening yet in the global economy. All the Sturm und Drang in the news media is exaggerated. There is only one new development, and that has not received sufficient attention. The OECD’s Composite Leading Indicators are one of the best economic leading indicators. Perhaps the most reliable, but also reported with the longest lag (yesterday they released the July numbers). It’s been flat since early. During the past 24 months the peak was 101.1 in February 2011. The trough was 100.0 in October 2011; it’s now 100.2. Composite leading indicators (CLIs), designed to anticipate turning points in economic activity relative to trend, show that the loss of momentum is likely to persist in the coming quarters in most major OECD and non-OECD economies. In Italy, China, India and Russia the CLIs continue to point to a slowdown. For the Euro Area, France, and Germany the CLIs point to continued weak growth. The CLIs for Japan and the United States show signs of moderating growth above trend, while in Canada the CLI continues to point to growth moderating below trend. The CLIs for the United Kingdom and Brazil tentatively point to a pick-up in growth, but remain below trend. The OECD Development Centre’s Asian Business Cycle Indicators (ABCIs) suggest that ASEAN economies show overall resilience, though some signs of weakening are observed. Employment in the US has slowly gained since the Spring 2009 trough, although slower than expected given the rate of GDP growth. Weekly new claims for unemployment (seasonally adjusted) have varied from 360,000 to 400,000 since 24 September 2011. All those confident descriptions of our “depression” and imminent recession have consistently proven false. The biggest surprise to me from the world economy has been in Europe. 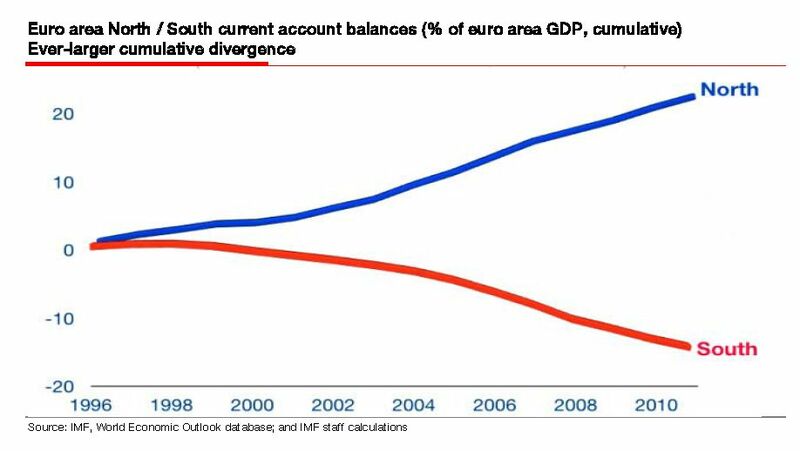 Not the slow decline of the periphery economies; that was an obvious and inevitable result of their austerity policies (recovery remains almost impossible without some combination of currency devaluation, fiscal stimulus, or radically lower rates — on a large scale). The surprise is that those nations have retained their cohesion under immense stress lasting years. For example, Greek unemployment was 16.3% in Q2 of 2011, 22.6% in Q1 of this year, and 23.6% in Q2. Despite hysteria in the US about their small-scale protests (eg, at Zero Hedge), these people have withstood adversity well. Perhaps too well (forcing new policies might have been wiser). Even more amazing, they remain devoted to the European unification project. What comes first: recovery or something breaking in the social fabric of a periphery economy? My guess: breakage. Something snaps. Note that support for unification remains strong in the northern European nations , despite the confident predictions of public revolt against unification. … Clearly the actions by the ECB buy time. But time for what? If the doctor has misdiagnosed the disease and is applying the wrong medicine, then all the time in the world will not see the patient recover. There is still precious little acceptance that it is not a fiscal crisis that has brought growth in the periphery to its knees. This is a classic balance of payments funding crisis of which the fiscal crisis is merely a symptom. Going into this crisis, we highlighted the burgeoning trade imbalances that were building within the eurozone. The GIPS (excluding Italy) experienced rampant credit growth as a direct consequence of an inappropriately low, one-size-fits-all, eurozone interest rate. The booming domestic demand growth in the GIPS resulted in massive trade and current account deficits that were mirror images of surpluses elsewhere in the eurozone  most notably Germany (the eurozones overall current account being in rough balance with the rest of the world). … Indeed the size of the current account deficits in the GIPS and the accumulated measure of those trade imbalances, i.e. the International Net Debt Position, were the biggest single warning signs of subsequent GIPS economic collapse. The problem here is that nothing much seems to have changed. Despite the GIPS being in deep recession, if not depression, it is surprising that the cumulated external imbalances have not corrected at all. Also surprising was Germany’s July orders data, for it seems that although overall new orders are flat-lining, export orders still seem to be holding up surprisingly well despite the weak eurozone and global backdrop. The July data suggests that any weakness that there is in the overall orders series is coming from the domestic rather than export sector. As so many have said so often, going back to the creation of the euro, the structure of the EMU is flawed. The measures taken to date, such as depressing short-term sovereign debt rates and providing loans that cannot be repaid, only buy time for structural reforms. The crisis started in March 2010, and the 2.5 years of time has been squandered. The primary treatment has been to administer austerity, hoping for the Confidence Fairy to bless their work. It’s failed so far, and probably will continue to fail. Yesterday the Fed announced that it will continue the open-market purchases of mortgage-backed securities it, which began in November 2008, beyond the scheduled end in December — at roughly the same rate as in QE2. While some research shows QE2 to have had some effect on the economy, the inflationistas forecast have yet again proven wrong. To support continued progress toward maximum employment and price stability, the Committee expects that a highly accommodative stance of monetary policy will remain appropriate for a considerable time after the economic recovery strengthens. This is daft. Consumers and business leaders do not act on the basis of Fed open-mouth operations. Nor should they, as Bernanke’s claims are bogus. Today’s Fed leadership cannot bind future Fed actions. No matter what they say today, the Fed probably will turn off the tap immediately at the first signs of recovery and inflation. More importantly, there is a large body of research showing that the Presidential “bully pulpit” usually has little effect on either public opinion or any element of US leadership. That probably applies even more strongly to the Fed Chairman. He cannot shape our expectations with a wave of his hand; attempting to do so shows either mad hubris or desperation. But there is an amusing aspect to this: watching the hysteria at another round of monetary easing. Inflationistas are like millennialists, always expecting the Second Coming of Inflation. But we’ve followed Japan into deflation-land. Several insightful experts have warned of a little-appreciated support of the global economy — China’s massive current account surplus, fed by buying Treasuries, gold, etc — might be vanishing now. It’s one aspect of a China bust (a scenario which has been well-covered in the news, and deserves close attention). If this continues as some forecast, it will change the world. The PBOC defeated deflation, not Bernanke. It’s generally held that inflation is the likely outcome of unfettered money creation in our fiat money world. However, in reality key global players do not live in this world. Most EM authorities allow the quantity of money in their economies to adjust as necessary, while managing their exchange rates relative to the US dollar. Two thirds of the growth in the global money supply since 2007 was from these countries, with China alone contributing 40-45%, whereas US money-supply growth accounted for just 15%. Forced money-creation in EMs is ending. A sudden deterioration in EM external accounts automatically produces a major deceleration in money growth. The key driver of this is inflation, which undermines EM nations’ ability to attract and retain capital, thereby reducing their need to create money. China’s capital-account surplus accounted for around half of its total surplus, but this year it has moved to a capital-account deficit and its foreign-exchange reserves are starting to decline. As investors in EMs have learned many times before, capital can move very quickly. A balance of payments anchored on a material current-account surplus can quickly become one driven by a capital-account deficit. We are close to such a tipping point, and if EM authorities respond by defending their exchange rates, a dramatic slowdown in money creation will ensue. Money-supply growth in the developed world is sluggish. This slowdown would come while developed-world central banks are still struggling to create robust, sustainable growth in broad money. US money growth has slowed from 8% YoY to 5%, while Japan has zero growth. Europe’s broad money is growing at around 3.5% pa, but this looks set to fall, as lending to the private sector is contracting. If Europe’s next step towards fiscal federalism falters, the region will face a monetary disaster. Whatever happens, the least likely outcome is accelerating money growth. The Chinese economy too has surprised decisively on the downside this year with the recently released August data catalysing another round of GDP downgrades. Stimulative measures have been tardy and largely ineffective so far. 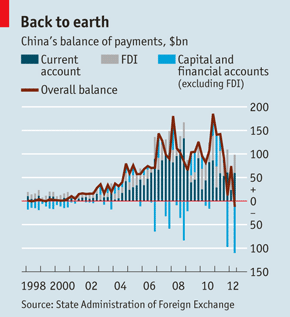 For me, the most significant data item over the holiday period was Chinas Q2 balance of payments deficit (see chart from The Economist). This is a game changer for the global economy. For as tensions mount within China and money flees for safer shores, we explain inside how this deficit exacerbates the risk of economic and political turmoil. … capital outflows in Q2 (red bar) outweighed the current account surplus. One of the themes we have been talking about over the past 18 months is how the current account surplus in China has been declining in recent years, not just because of recent weakness in key export markets such as the eurozone, but because the renminbi is tied to the US dollar. The trade-weighted exchange rate has therefore ended up becoming excessively strong. … We have been among a handful of commentators to have consistently identified the rise in Chinas FX reserves as a key liquidity pump for both itself, and indeed the global economy. For much as the Chinese authorities have complained recently about profligate US monetary policy and QE, the Chinese have been doing the same  i.e. printing vast quantities of renminbi to peg their undervalued exchange rate to the US dollar. This is a common theme in emerging markets in general and often helps explain rapid growth rates and asset booms in those countries. And to the extent that excess optimism about Chinas growth has been built on unstable, Kilimanjaran mountains of debt, we have long warned that this pack of cards could come crashing down  in stark contrast to the consensus. Although the absolute decline in reserves is small, the change marks a massive shift down through the gears for the monetary printing press. And if the capital outflows accelerate, the next gear may yet be reverse. GMOs Edward Chancellor wrote an excellent analysis on this very topic. Discussing the clear acceleration of capital flight in Q2 he quotes Victor Shih, of Northwestern University, noting that wealth is highly concentrated in China and given recent economic and political developments, rich Chinese have many incentives to take their money abroad. When capital flees the country, China’s forex reserves will shrink. Professor Shih reckons that the collective fortunes of the top 1% of Chinese households are larger than those reserves. This vulnerability can be viewed from another perspective. Chinese money supply (M2) is not only twice the size of the country’s economic output, it is more than four times greater than the forex reserves. Reserves are currently equal to 22% of China’s money supply. By contrast, the forex reserves of the Asian Tigers averaged around 35% of money supply when their currencies collapsed in 1997. Previous Post Death celebrates 9-11. Can we stop and think before we walk further along the road of terror? Next Post Today we ask the mineshaft: we know what’s wrong with America, why can’t we fix these problems? Nowhere to hide is the hallmark of a global, synchronized, debt-deflation. 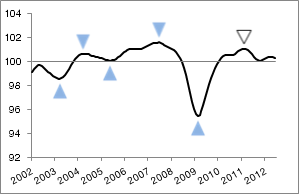 Capital flight from emerging market economies? To where? Soon to default Spanish bonds with high real yields, or bulletproof German paper paying negative rates? The U.S. municipal market? Don’t do that. Don’t have a synchronized run-up in global debt creating (or enabling/supporting) massive imbalances in regional wages, asset price run-ups , capital movements, sector bloating (notably Finance, Insurance and Real estate in developed economies) and (infrastructure, chemicals manufacture, and consumer products manufacture) in emerging markets. Don’t do that because the inevitable debt unwind will cause corresponding unwinding in asset prices, sector shrinkage, equalization of wage rates across regions (and not in a good way), and social turmoil that your institutions will be poorly equipped to deal with. Western bankers believe on the magic power of austerity, of the printing press (as Ben B said in his famous 2092 2002 speech, see below), the Confidence Fairy, and themselves. Not much room in their heads for doubt or original thought. People, Ideas, Hardware. In that order! Clearly, we’re getting down to that. My mistake; I forgot you cannot see those yet. Here is the one from 2002: “Deflation: Making Sure ‘It’ Doesn’t Happen Here“, Remarks by Governor Ben S. Bernanke Before the National Economists Club at Washington DC, 21 November 2002. Permit me to suggest that perhaps it’s not so much a matter of western bankers actually believing in the magic power of austerity, so much as austerity-induced deflation benefits debt-holders like bankers (because in a deflationary environment the real monetary value of a debt increases as deflation worsens) — whereas the alternative approach to digging your way out of a financial bubble’s aftermath, as typified by Iceland’s approach, involves writing off the bad debt and letting the banks go bust. Bankers prefer the former approach to the latter, I would imagine. Ergo austerity, touted by the bribed minions of the bankers, their politician and economist sock puppets. That’s a very cynical perspective. Probably right, also. Here’s some more proof that the current round of monetary easing isn’t going to help very much. Ann Saphir at Reuters pulled out her calculator and discovered that the rate of funds entering the market in QE1 was $75 billion per month. The less effective QE2 pumped $100 billion into the market per month. This round is expected to need even more cash per month to be effective and is going to only put in $40 billion per month. It appears that Paul Krugman was correct, Bernanke is attempting to be creditably irresponsible without burning down the bank. I wonder what happens when the market realizes how ineffective this round will be? Here’s a copy of Ann Saphir’s article: “Federal Reserve’s QE3 could rival size of huge first stimulus” NBC News, 14 September 2012. This stuff is complex, and her analysis is confusing. The Fed did three things. (1) The Fed is now running Operation Twist through yearend, selling $45bn of short-term securities and buying long-term securities. To this they added an outright buy of $40bn per month in long-term securities. The combined buy of $85bn in long-term securities should lower long rates (esp mortgage rates). The new $40bn/mth is pure monetary expansion. (2) Second, they extended their forward guidance to 2015, and pledged to keep rates low “for a considerable time after the economic recovery strengthens”. (3) They laid the groundwork for an open-ended QE program. The last two steps are, like the ECB’s pledge of unlimited buying of periphery securities, attempts to shape “expectations” — if successful, a powerful force on the economy. The Fed has spent 30 years building institutional credibility as an inflation-fighter (the primary reason the Fed was created as quasi-independent institution, taking monetary policy away from Congress and the Treasury). Now they’re attempting to build credibility for an opposite claim, a willingness to induce inflation — and so lower interest rates (ie, the base rate of real short-term riskless rates) below the zero-bound. I’ll discuss these matters in the next post. This article has two interesting messages. (1) A year ago they forecast that the US would be in a recession by now. Now they update that prediction. (2) More importantly, they remind us that we never know the current condition of the US economy. Think back to four years ago in 2008, a couple of days before the Lehman failure. Looking at the data in hand, you would see GDP growth at about 1% in Q1 and 3% in Q2. More specifically, Q2 GDP growth had just been revised up on August 28 from 1.9% to 3.3%, sparking a 212-point Dow rally that day. In March 2001, 95% of economists thought there would not be a recession, but one had already begun. And we do not recall anyone outside our shop predicting the 1990-91 recession beforehand. Hardly any economists recognized the severe 1973-75 recession until almost a year after it started. Indeed, that recession began with the ISM at 68.1, and payroll jobs growth did not turn negative for eight months. In 1970, unaware that the economy was nine months into recession, none other than Paul Samuelson said that the NBER had worked itself out of a job, meaning that improved policy expertise had made recessions very unlikely. But what data supports our recession call? We just discussed what GDP had looked like four years ago. Please note that for each of those two quarters GDP growth has since been revised down by two to three percentage points. Those are huge revisions. Likewise, GDP growth prints for each of the first two quarters of the two prior recessions were revised by about two to four percentage points. The takeaway is that, in the early stages of recession, the data are almost always revised down, and the revisions tend to be quite substantial near business cycle turning points.